Mississippi. We can already tell that season 3 is going to be the best yet, so we’re going to post recaps of every episode! 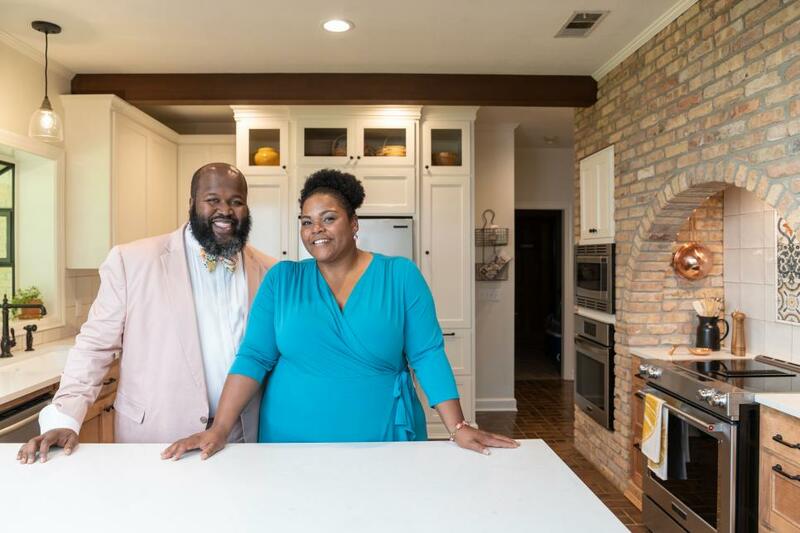 On last night’s episode, we got to meet the vibrant Watts family! Wanna know more about the Watts family? Click their name right above and head on to LMCo’s journal to see an exclusive interview with Toy and Cory! LMCo will post on their journal every week after the episode. First of all, let’s talk about budget. The Watts family has an all-in budget of $300,000. For a lot of places, this is pretty average (or even below average)! But in Laurel…that’s a big budget for our real estate market! Laurel’s median home value is $83,700. Compared to the USA national average of $222,800, that’s a crazy deal! 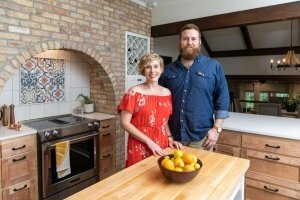 Hearing this got us all excited to see what Erin and Ben could do with that budget! Our first stop this episode is the Yeates House! 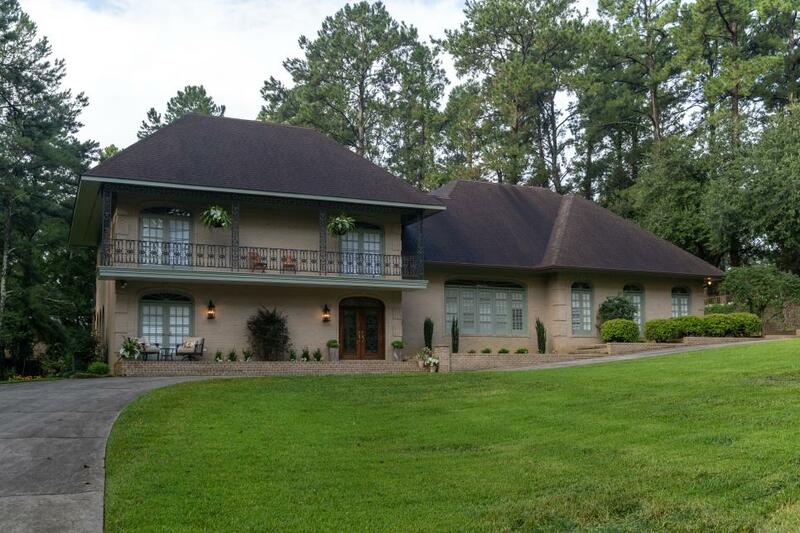 Built in 1978 by Geraldine and William Yeates, and it features a whopping 5,300 square feet! That includes 4 bedrooms, 4 bathrooms, and a huge garage. We think this fun-loving family needs a home with some personality! Thankfully, Erin had some pretty great ideas on how to spruce up the place. 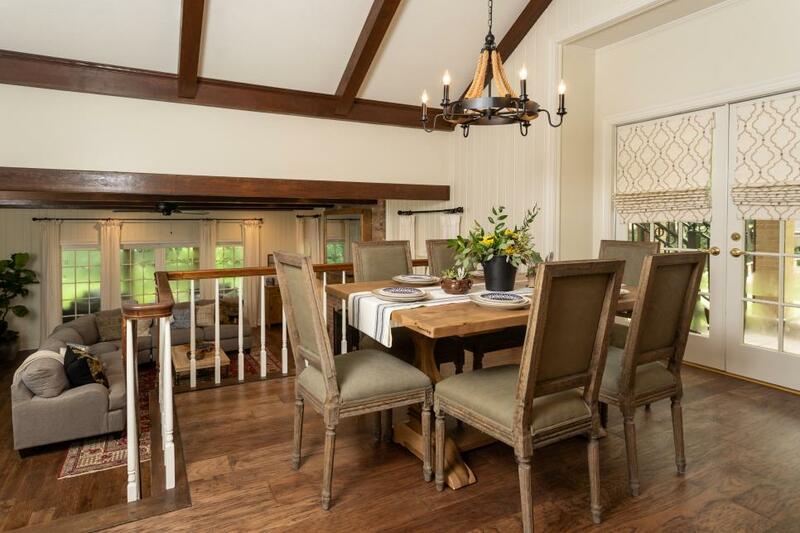 We loved the Yeates house, but with the reno budget leaving everything at an even $300,00, we think that might be cutting it a little close! Best Feature: The back yard was absolutely outstanding. It had lots of space and a beautiful landscape with a pond. It seriously had us swooning. the Yeates house, but it’s still a great size of 3,600 square feet with 4 bedrooms and 3.5 baths. The first thing we noticed was the beautiful New Orleans style wrought-iron balcony. 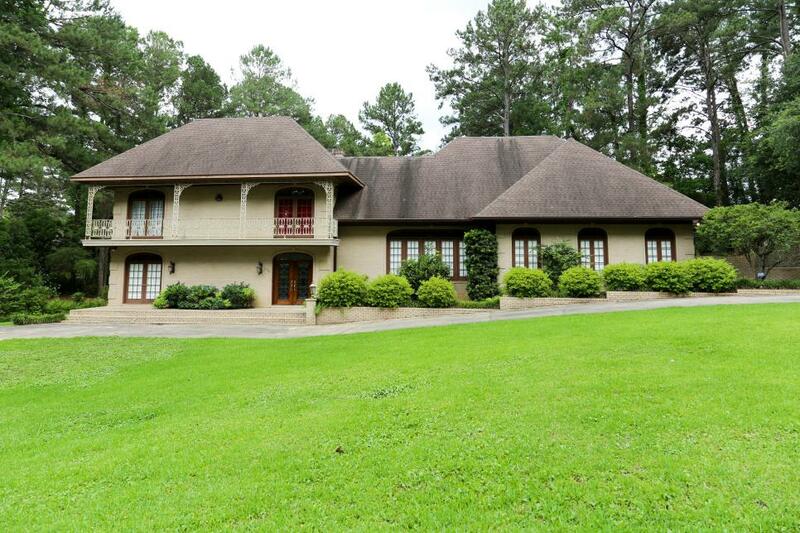 Secondarily, we love the large front yard and circle drive. Like the Yeates House, this one also has pretty neutral coloring. As we venture inside, the first thing we see is the beautiful wood flooring in the foyer, along with a stately chandelier. Not to mention the gorgeous, rounded doorways and elegant moulding! Then we travel to the living room…and there a good many pros and cons. 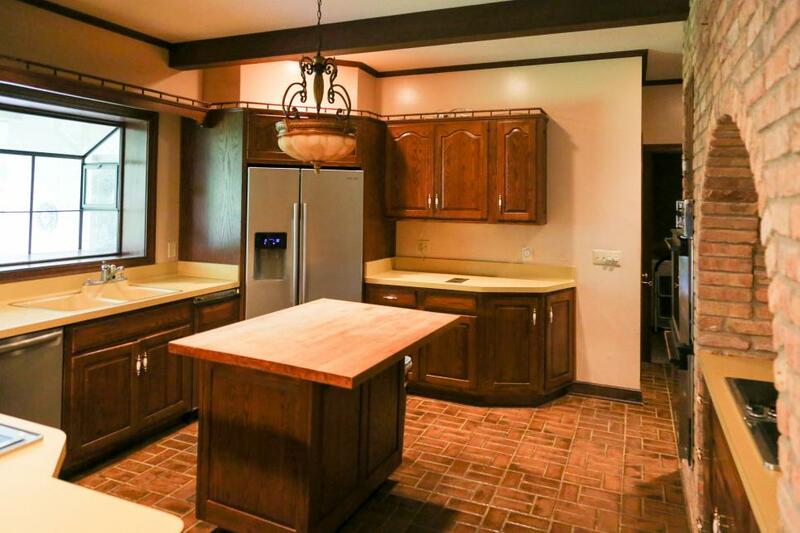 The spacious size with an open concept to the kitchen is awesome and perfect for entertaining! The balcony dining area and stairs are also such a nice touch to the character of the home. Not to mention, it’s the most extreme (and coolest) sunken living room we’ve ever seen. 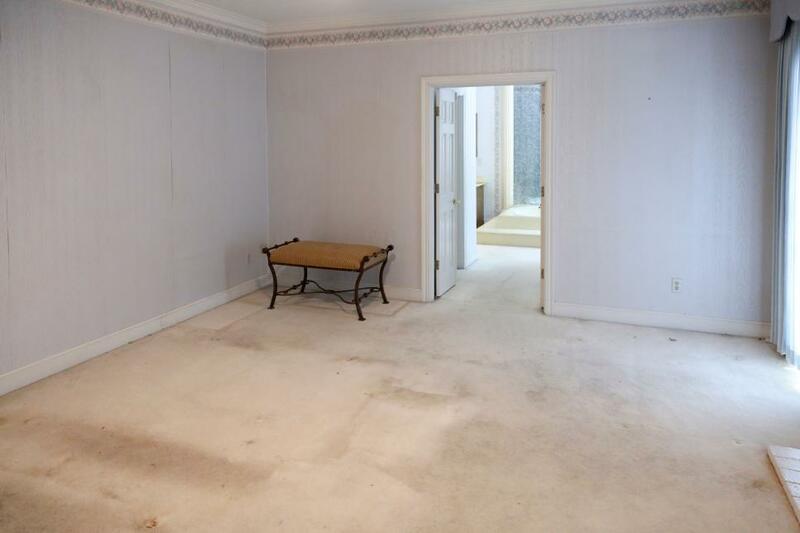 What we don’t love: The paneling and carpet. 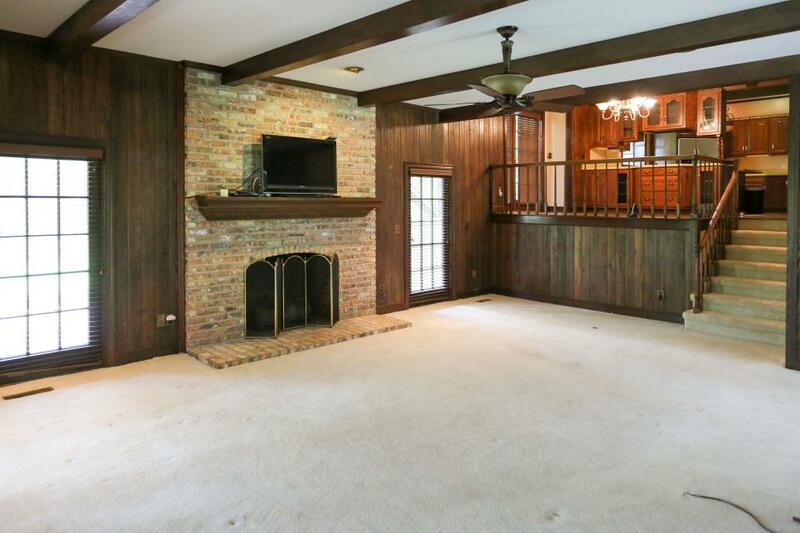 Wood-paneled walls were a huge trend in the 70’s. Mix in some carpet, and voilà! You’ve got every 70’s family’s dream sunken living room. Somehow, we just don’t think this is the best combo for the Watts family. 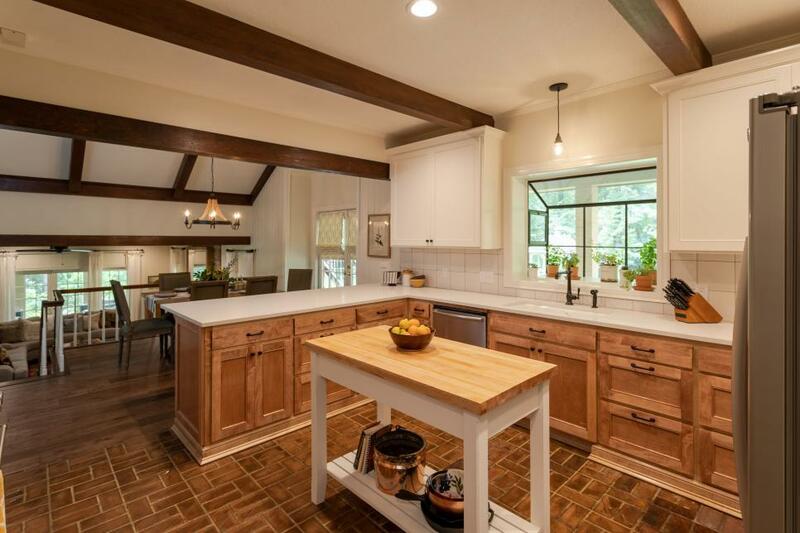 Although we’ve got some more very 70’s details like yellow-ish formica countertops and cabinetry that matches the walls of the living room, this kitchen has major potential. 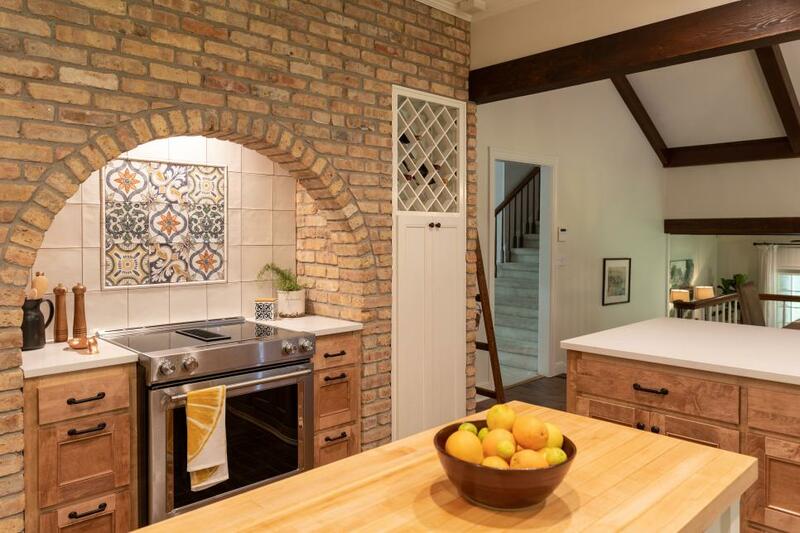 What we love: The brick-framed oven. 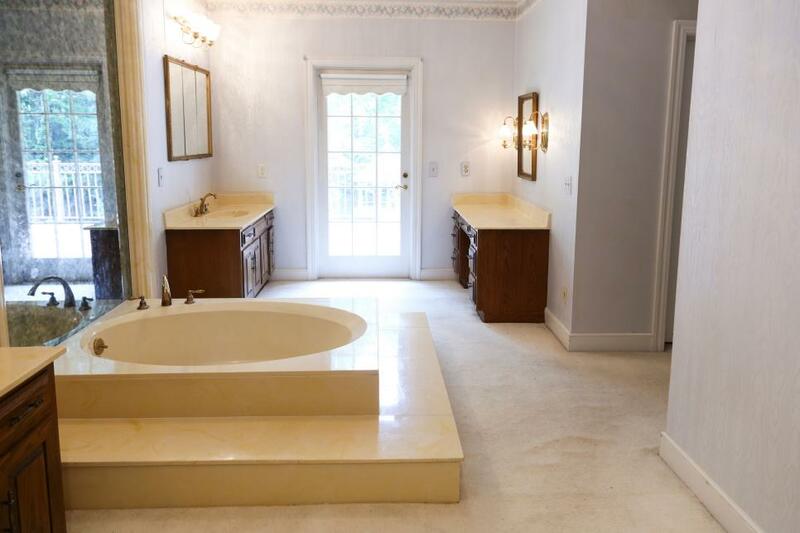 Like Erin said, “it’s a very Scarface bathroom”. The bedroom was a nice size, and really just needed new carpeting, light fixtures, paint, and what-have-you. But, the bathroom had lots of interesting surprises. More carpet. Smoky mirror. Fake columns. Not one, not two, but three vanities. 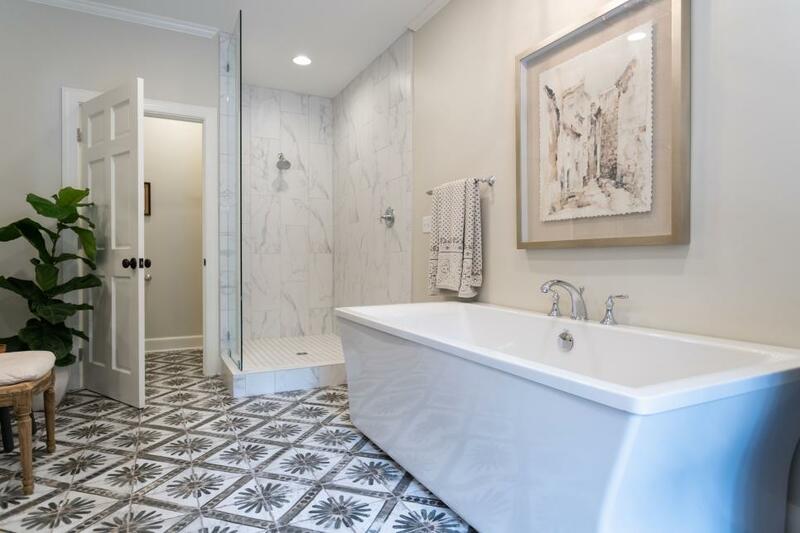 Yes, this bathroom had an interesting “before”, but we’re more than ready to see the “after”. 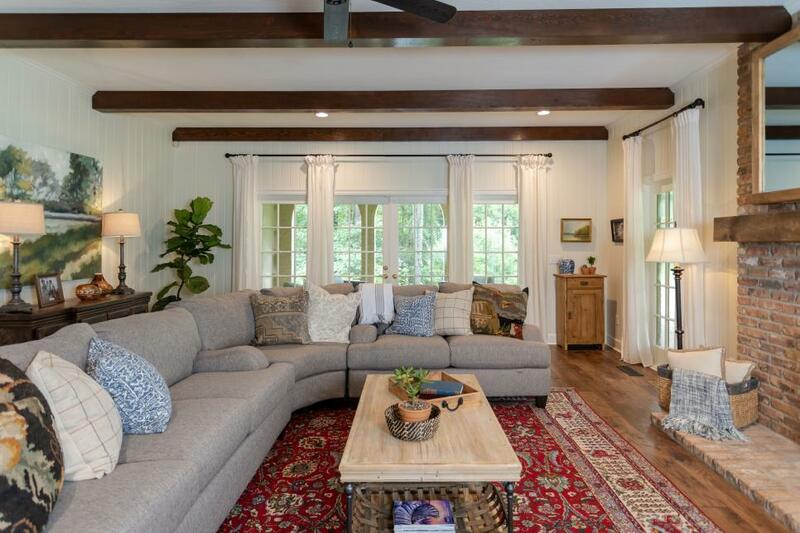 Overall, we loved the Herndon House and all the potential it was sporting. We’re so glad the Watts picked it! 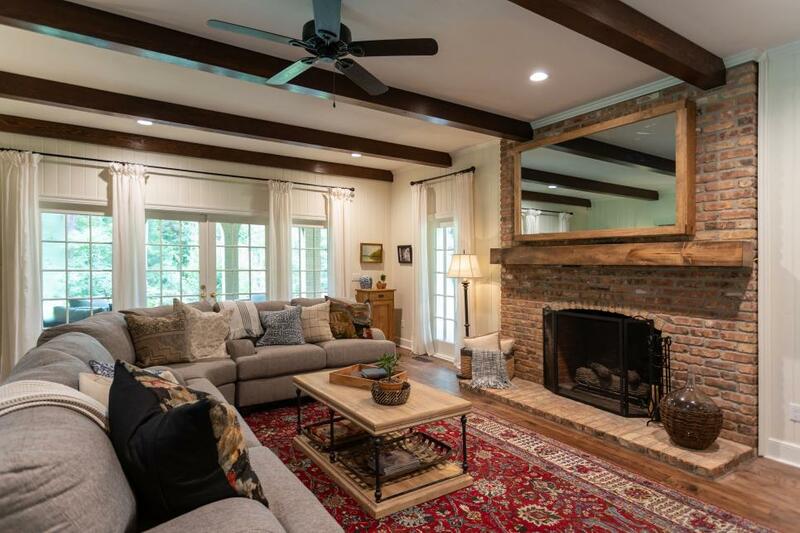 Obviously, Erin and Ben completely transformed this house into something even more beautiful and so personal to the Watts Family! The exterior had more contrast and color, and the landscaping was cleaned up. The TV in the mirror is quite possibly the coolest DIY we’ve ever seen on the show. Not to mention, we’ve got a Lott Furniture Co. item in here! The Watts Sectional is the perfect addition to any big space. It even has a removable, rounded corner piece for switching things up! If you remove it, this sectional can act as a freestanding sofa and loveseat set. Contact us to shop the Watts Sectional today! This premier definitely started out season 3 with a bang. 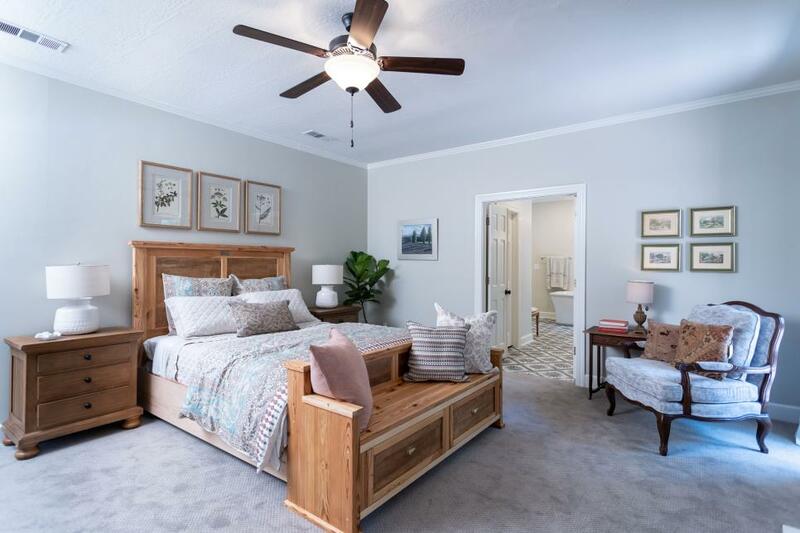 We’re just smitten with the Watts family and are so proud to welcome them home to Laurel, Mississippi. **** None of these images are our property (we included credits), and this is solely our commentary. 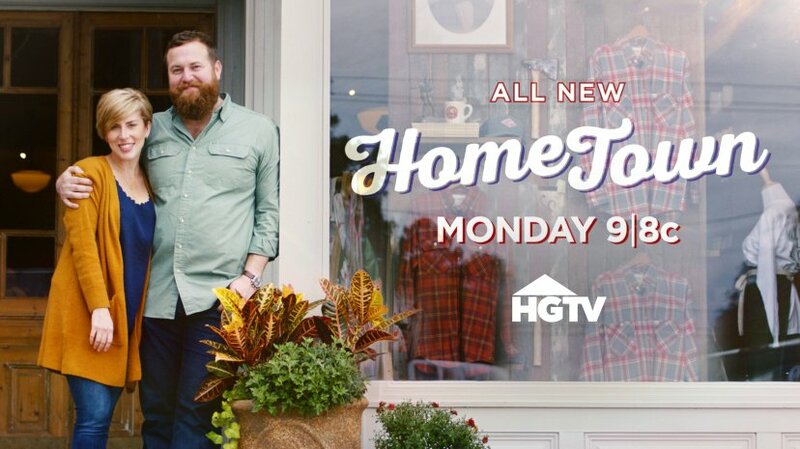 Our opinions do not reflect on Home Town Season 3 Productions, HGTV, the cast and crew, or Scripps.